While Home Normal hasn’t been totally gone, it’s been relatively quiet over the past year. Fall releases from Wil Bolton and Ruebke set the stage for the current winter crop, which includes Olan Mill, Melodía, Hotel Neon, Elian and Fabio Orsi. The first of these were released during the closing weeks of December, and the others are set to follow in January. The label is still run by Ian Hawgood, who married and moved to Japan a few years back. The 2011 Fukushima disaster took a toll on the neighborhood, the house and the label, and afterward, Hawgood and his wife spent many months donating to local causes and helping out physically wherever they could. Poetically, it seems that Japan is the primary market for Home Normal releases, despite their international pedigree; perhaps the overall timbre of the releases is the reason, as the majority of music is meditative and calm. Each release now comes in handmade washi paper, making a physical connection to the nation of origin. Olan Mill‘s album is the first and the briefest of the new batch, clocking in at less than half an hour. Its soothing tones need not be stretched; the set allows just enough time to change a mood. Former incarnations of the project have involved collaborators, but this time around it’s just Alex Smalley. These pieces were recorded over a number of years, and a couple of them are live, although one would not realize this from listening as no audience is apparent. Instead, one experiences a wash of serenity, beginning with the flurry-like tones of “Winter of the Electric Beach.” The impression echoes the title, which refers to a boat being so low in the water that small waves wash over its deck. When the familiar looped vocals enter on “Holocene”, one thinks of sirens, yet not of a dangerous shore. Instead, the feeling is that of deep safety. The small waves may be washing over the deck, but the large waves cannot conquer the hull. Melodía‘s Saudades was a favorite around these parts in 2013. While the former album possessed a sense of bittersweet nostalgia, the new work is a celebration of friendship, recorded during Federico Durand’s recent visit to Tomoyoshi Date in Japan. Recorded inside and outside, in humble yet inviting locales, Diarijo de viaje (Travel diary) is warm and cozy, a sweet, folk-tinged collaboration with a hint of the personal. Birds can be heard throughout numerous tracks, while household sounds make an appearance in “La Luz de la Tarde”, along with various hand-held instruments. The random nature of these latter sounds provides the suggestion of childhood, which is no surprise given the fact that both artists are recent fathers. As a music box begins to play, the association is cemented. Joy is being rediscovered through the next generation. Hotel Neon‘s self-titled release (16 January) is the most melancholy of the batch, beginning with measured footsteps and slow tones. The album is a remastered version of a cassette issued in 2013 by twin brothers Michael and Andrew Tasselmyer, the irony being that Hawgood remastered it using twin tape decks. The music is never in a hurry to go anywhere, weighted down by an unnamed sorrow. “A Lament” leads to “Dust and Drag” and “Lowly”. Counterintuitively, it takes a great deal of motivation to create music that sounds like it doesn’t want to get out of bed, and this knowledge serves as a counter-weight to the burden. The sorrow comes and goes in waves, occasionally replaced by hints of light, like the sun struggling to be seen through the clouds. In empathy, there is hope. With a title like Harrowgate (23 January), it’s clear that the music will be a little different from the rest. Elian‘s work is difficult to categorize, as it flirts with various genres, including those of dark ambient and modern composition. His new work possesses an increased intensity. Far more immediate than Michael Duane Ferrell’s prior offerings, Harrowgate seems prepared to pounce, rather than remain in the shadows. Unfolding in five unnamed parts, the work operates as a suite, developing plotlines as it proceeds. An amusing press release admits that Home Normal fans were “confused” by Elian’s last work on the label, but this one is easier to incorporate into the ethos. 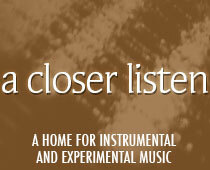 One simply needs to expand one’s definition of “ambient” to include music that can guide one to an alert state of calm. As Harrowgate is intensely impressionistic, its interpretation will vary from listener to listener. If it is considered holy – touched by organ tones and distant grace – then the holiness is tempered by fear. Yet if it is considered dark, then the darkness is tempered by light, as tendrils of melody are woven throughout the abstractions in inextricable fashion, like weeds and wheat, waiting to be harvested together on the final day.